Within a week of your scheduled trip, a staff member will come to your class at a convenient time, to pass out required literature and give some preliminary instruction. He (or she) also will discuss educational topics that are relevant to the age group, concerning the habitat, environment, and resource stewardship. Vessel departs to fishing grounds (15-45 minutes). Approximately 11/2 to 2 hours of fishing. 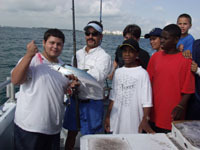 Children will be interactive in baiting hooks, fish identification, and proper handling, and releasing of fish. On the return trip to the dock, students eat lunch, have question and answer time with crew, or watch a relevant video. Student are also TESTED on topics discussed. 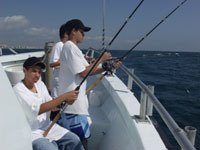 Call your children's school, get your group together and contact us!